Milestone photos are always a great reminder for me as to where I have started and came from to where I am at today. Sweet little Noah did just that for me a few weeks ago. Noah’s parents hired me to photograph their engagement session a few years back and they not only turned into repeat clients but like all of my clients they became friends. I make it a priority to develop relationships with my clients. Noah was cute as a button as a newborn and now he is killing me with his expressions and his smile. 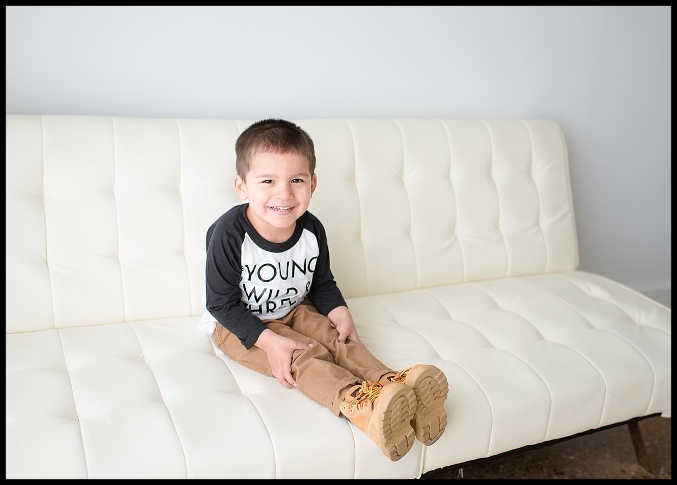 Check out the photos below to see how Noah did for his milestone photos. Noah turned three and he wanted the world to know! His mom, Monica, couldn’t have picked better outfits for his shoot. Monica and Carlos came to my studio in Barrington and they allowed me to have a lot of fun with Noah during this shoot. I made Noah so happy when I allowed him to take some photos with my camera. The smile that came upon his face was priceless. Milestone photos are always a great way to mark how your family is growing. Take a look at the photos below to see how much fun I had as well as Noah. Noah, the little white sox fan, that he is had to rock his Sox hat and it fit well with the milestone photos. Also check out the different poses and attitude shots that Noah did for me. This kid is so cute!! !